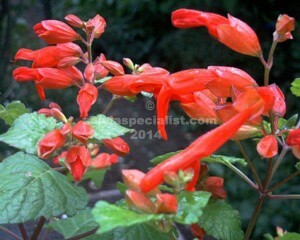 Regla is a Mexican winter dormant shrub with vibrant orangey red flowers and calyces in autumn and attractive shiny leaves. It is supposed to take quite a few minus degrees of frost and withstand drought once established which is perhaps why I killed one with waterlogging in a big pot. I think it could grow as a tall shrub a few metres high. Frost limits its height for me. It is not one you see often any height. Sessei is a similar salvia with similar growth. It has lighter green leaves. sessei begins to flower in May so usually a frost cuts it before it gets in full flower in Albury.